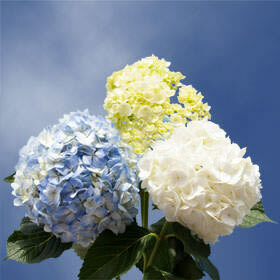 Cut Hydrangeas are beautiful when arranged in a decorative design or standing alone. Available in assorted colors, these florets present a beautiful array of blooms that will completely fill an arrangement. Known for their uniqueness and delightful disposition, they are also used to bear thanks. They can be used at any setting, for any occasion. Striking as a table centerpiece or bouquet, they command attention whether in white, blue, green or tinted another shade to match your decor. Popular at dinner parties and social functions, cut hydrangeas are known worldwide for their versatility and ability to conform to any use. 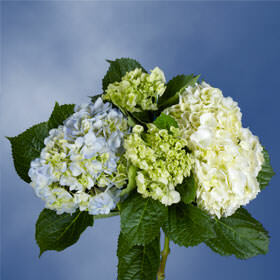 These striking blossoms are also used in romantic variations, spreading love and joy. You can't go wrong with them, as they conform to your personal purpose. 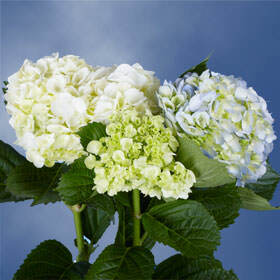 Globalrose offers the freshest florets you can purchase wholesale. Grown in state-of-the-art greenhouses to maintain a natural habitat, the quality and crispness of our products cannot be duplicated. Our competitive prices allow large quantities to be purchased at a great value. Shipped directly to your door, we guarantee value at every step. Our assorted Cut Hydrangeas will captivate your guests and give you more reasons to select Globalrose as your flower vendor. We guarantee fresh, youthful and beautiful petals every day, year-round.